If you’re feeling like Jon Stewart in this shot, you’re not alone. If you fall asleep muttering the words “early decision,” “early action,” “will I survive?” and/or “get me out of here,” you’ve got company. If you’ve applied to the most selective colleges and universities in the country, remember that it’s a number game, and thousands of highly qualified students are turned down. At the most selective colleges, the admit rates for early decision are a bit higher than for regular decision, but that’s because the early decision rates include recruited athletes and other special category students, not because their standards are lowered. Make a Plan B, even if you might not need it. If you are turned down from your first choice, don’t spend the next week despairing. Mourn for a little while and then pick yourself up and do the work to apply to other terrific and appropriate colleges. If you haven’t done this, consult the best college guide around: the Princeton Review’s Best 382 Colleges, which gives two-page write ups that are chocked full of useful information, from the atmosphere on campus to ratings for professors. The book is easily available and utterly essential. Make a master list of colleges you’re going to apply to, with all of required essays for each: the topic, the lengths, and the due dates. As you look over the list, see where there are overlaps. Can you use essays or pieces of essays for multiple colleges? Are some of the prompts similar enough to recycle with minor modifications? Divide the essays into categories, based on these criteria. Do the easier ones first, so you gain confidence. Most high school students hate to brag. The essays are not brag-fests, but they are opportunities for you to display what you care about, how you think, and why you’re a promising student for that institution. When writing the “Why You Want to Go to Our College” essay, make it specific to that college. Mention a campus visit, specific majors or courses, research opportunities with specific professors. Remember: you’re applying to an educational institution. They’re looking for students are who serious, curious, and committed to their interests – even if they are not sure what they want to study. 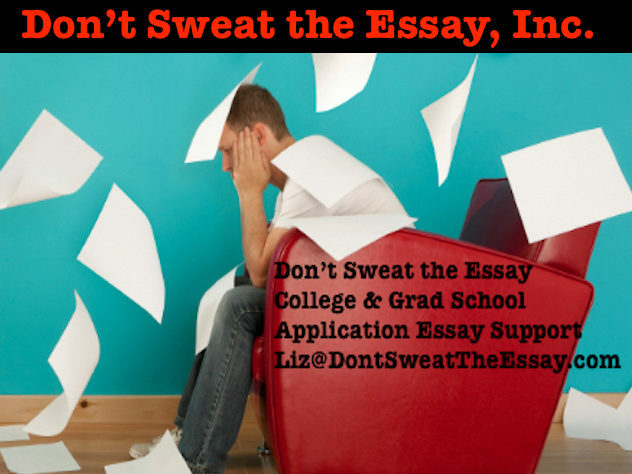 If you need guidance with any phase of these supplemental essays, or you want review your Common Application essay, please shoot me an email: Liz@DontSweatTheEssay.com or call 1-885-99-ESSAY (East Coast).